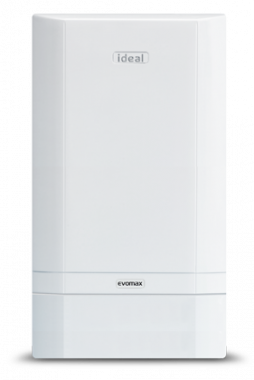 DISCONTINUED.The EvoMax boiler is a condensing boiler which has been designed and manufactured by Ideal. It is a regular boiler meaning your heating system needs to incorporate a boiler, extended controls, a hot water cylinder, a cold water storage cistern and a feed and expansion cistern located in the loft. This boiler is a highly efficient model with an efficiency rating of 97.2% which makes it an A rated boiler. This has been achieved through careful component selection which also enables straightforward installation and servicing. Key features include a robust cast aluminium silicon alloy heat exchanger, high 5:1 turndown up to 110% part load efficiency and an NOx <40mg/kWh (class 5) for all natural gas boilers. This boiler is compact in size and offers a great deal of flexibility in terms of installation. It can be either a floor standing or a wall mounted boiler as it includes an optional frame and header kits which offer-in line and back to back cascade options. This unit is available as LPG or natural gas and in a wide range of outputs: 30kW, 40kW, 60kW, 80kW, 100kW, 120kW and 150kW. This particular unit has an 80 kW output which is perfect for properties that have multiple bathrooms. This boiler has simple, user friendly controls and a large back display to help you to manage your heating easily and effectively. A 5 year warranty on parts and labour is included so you can be sure you are purchasing a highly reliable boiler.